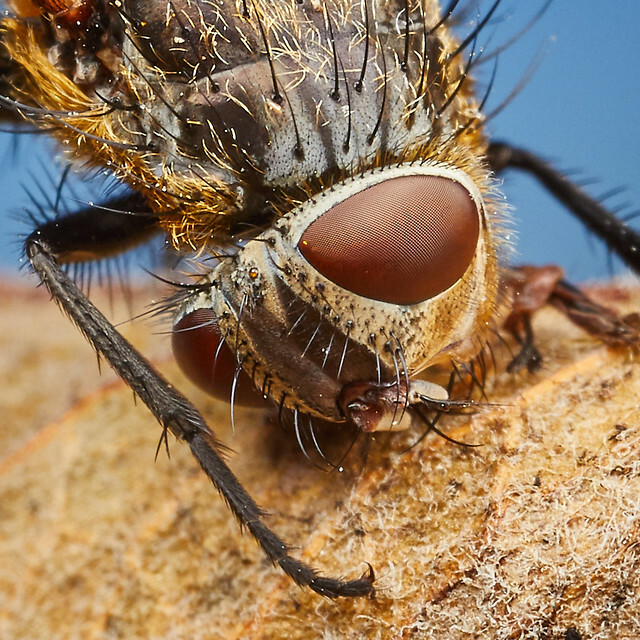 At first I thought it was just some sort of weird decay on the abdomen of the fly, and I was mainly focused on doing a memorialized death photo, if that makes sense. Got great focus on the eyes, and the resolution of the 5D IV really shows here. Coming from a 5D II I was blown away. 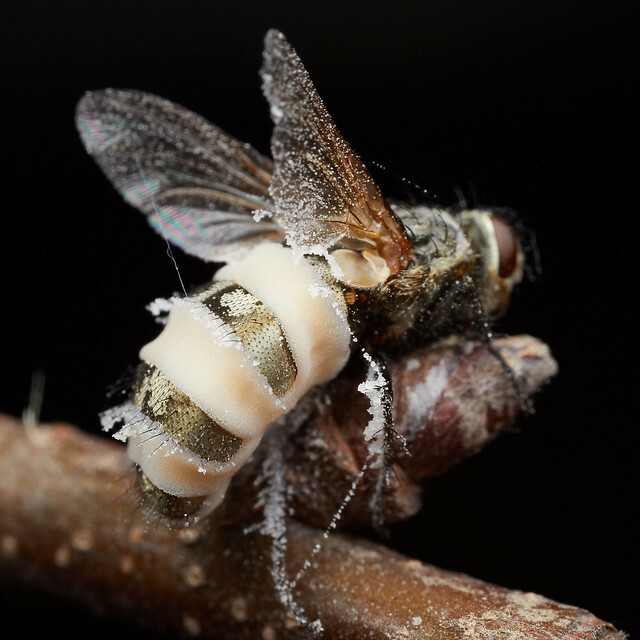 So I go back to my house and start to do some research, and find out the white on the abdomen is actually a fungus. 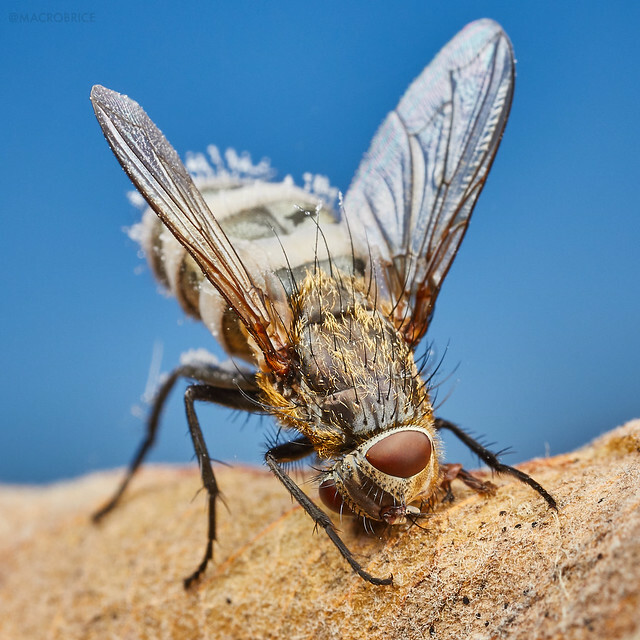 The fungus infects the fly, causes it to bloat and die, and then the interstitial membranes in the abdomen swell and release spores of the fungus. 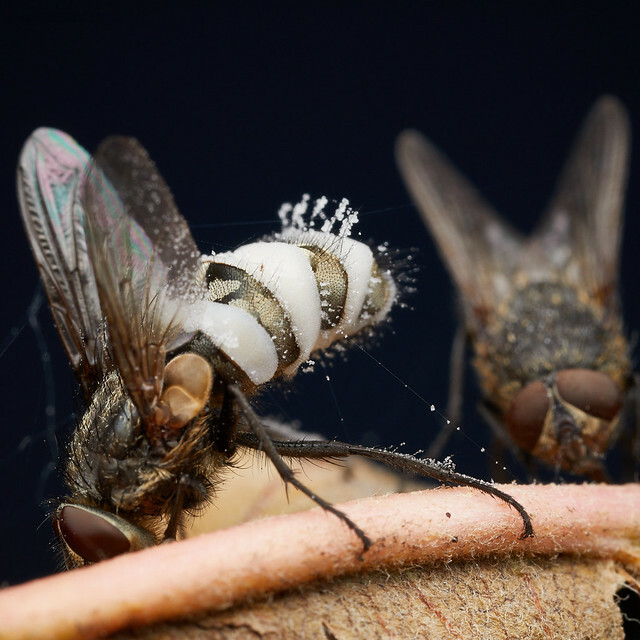 This is where things get interesting: the fly dies in a sort of "mating posture". Unsuspecting suitors swing by for a quickie, and end up catching the worst STD of their short life. The fungus can either spread this way or just by wind. 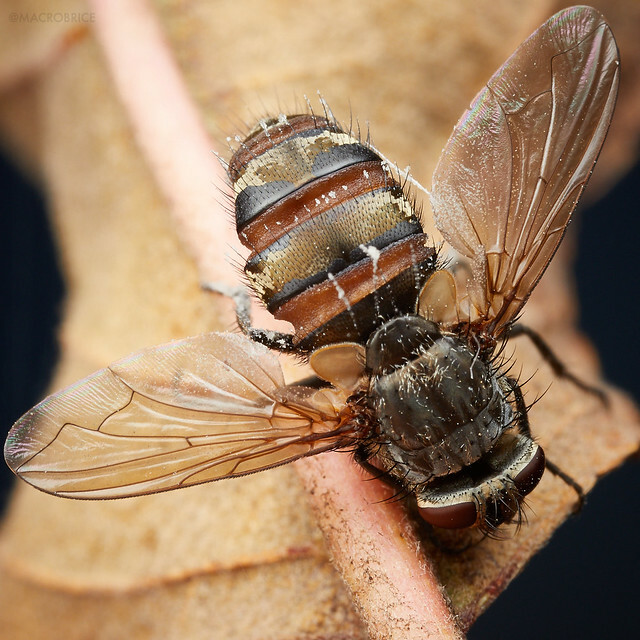 So I go back outside looking for the same fly to get a better photo of the abdomen. 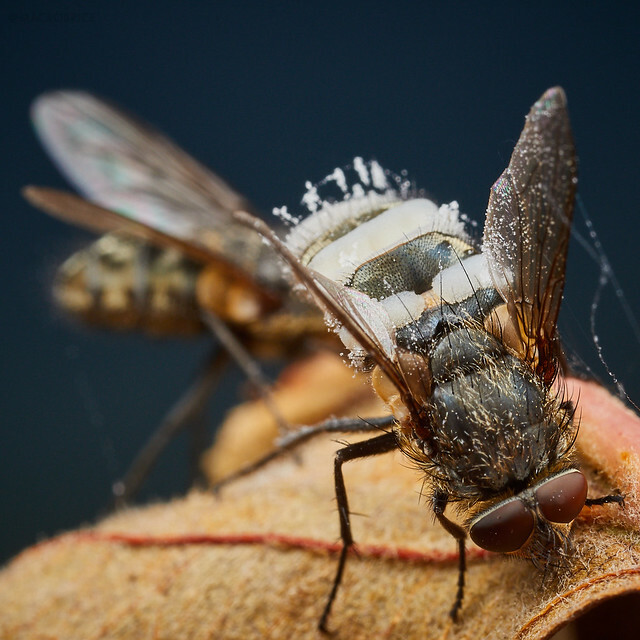 Turn out I can't find it, but what I do find is that the tree that the fly was on is completely covered in dead infected flies in varying stages of the fungus' life cycle. Amazing! Wow, scary stuff but very interesting. Got shots ! How fascinating!!! That is an amazing set of pictures and I learned something new about STDs. Fascinating indeed. The biology story behind is exactly why I am interested in macro. Thank you very much for sharing. I was joking when I said STD, but now that I technically think about it the fungus definitely fits the description! Gruesome but oh so interesting. I haven't found any examples here in the foothills of Western North Carolina but at a little over 6,000 feet on Mt. Mitchell I found numerous examples of this some years back on a hike over the ridge line to Mt. Craig. These are fantastic! I teach a few lectures in mycology every year. Would you mind if I used one of these images in lectures? No, go right ahead! I take these for fun, and I would love for others to see and learn from them. love it (and I´m glad we do not have such STDs in humans). 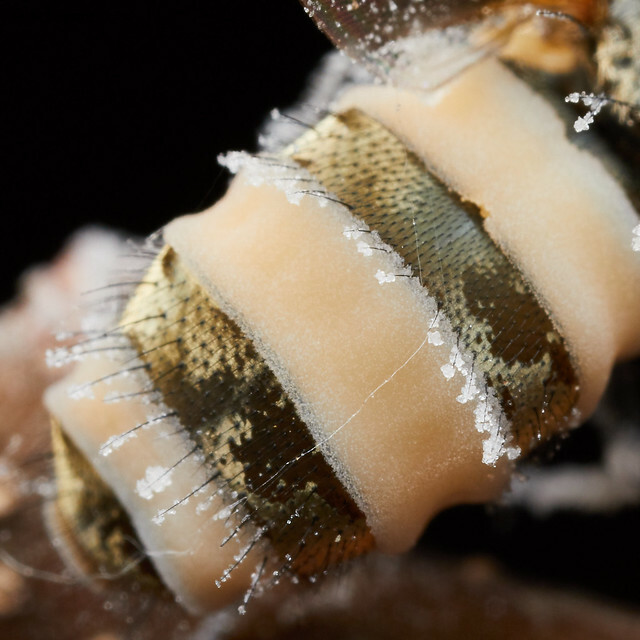 Excellent images and educational -double win! A very interesting post and great images, fascinating.